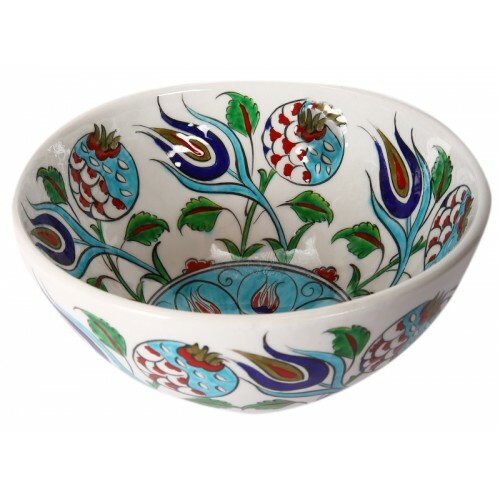 Classical Iznik porcelain bowl with pomegranate and tulip pattern was exclusively designed and produced by the artist Zeynep Tişkaya. A different group of Iznik tiles also known as “Damascus Works” in the Ottoman art differs from the others in terms of both colours and patterns. In this group of tiles; green, turquoise and cobalt were used instead of red. 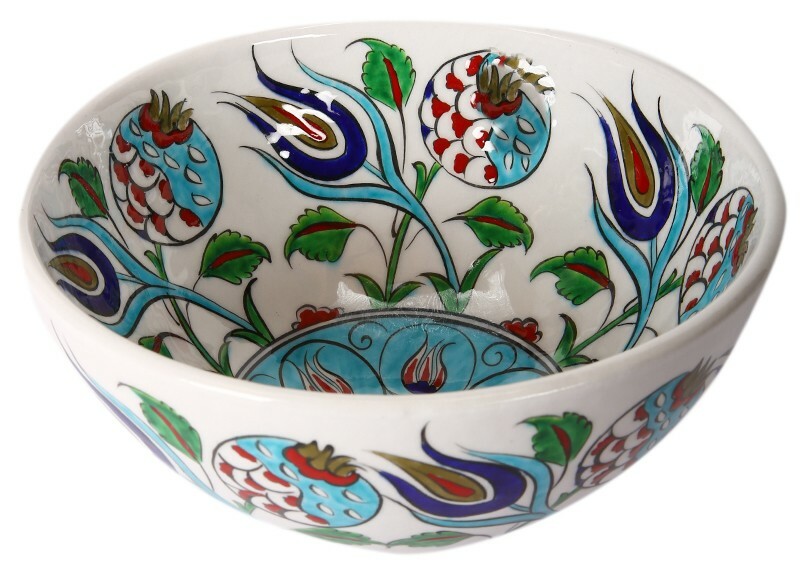 Within the patterns, small pomegranates and artichokes may be observed. The reason why these patterns which are seen between 1525 and 1550 are called as “Damascus Works” is that they are located under a lampion of a mosque in Damascus. Today, the lampion is being exhibited in a museum in England. Material: it is composed of china mud, semi precious stone quartz (80*85%) and a mixture of clay and lustre. Various forms are given to this mixture by means of different techniques. These forms are fired in 1000 – 1040 degrees centigrade and are prepared for dying. 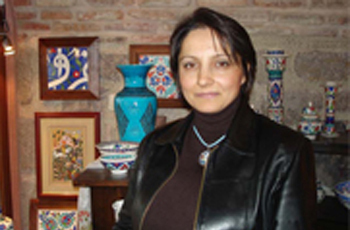 The patterns are dyed by means of “sıraltı” technique and are fired for the second time. With the effect of high temperature, the lustre melts and turns into a transparent glass-like substance. Hand-wash is recommended. The product should be used solely for dry food. Dimensions: height 10, diameter 20.5 cm.